Do you have a heirloom stone that has been in your family for years and was just recently passed down to you? Having something as special as a family heirloom stone creates an everlasting bond between you and your family. You love the sentiment of the piece but maybe the design or setting doesn't fit your style. We have great news for you! There are so many ways you can reset a heirloom stone and create something that you love. In many cases heirloom stones come from a ring passed down from a family member. Maybe it was your mother's or grandmother's engagement ring. 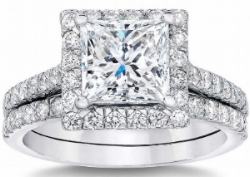 Now, you love the stone and the sentimental meaning it holds, but you don't love the style or setting of the ring. The style possibilities are endless when resetting your heirloom stone. You can set the ring into a more simple setting or a more embellished setting, it totally depends on your person style. You can even add other stones to your ring like smaller diamonds or colored gemstones to really make this new piece of jewelry your own. A solitaire pendant necklace featuring one single stone is a classic jewelry piece that every woman should own! You can't go wrong when resetting your heirloom stone into a pendant necklace. The stone can be set in a variety of settings from prong to bezel, depending on your style. You can even choose the metal type of the necklace. White Gold & Platinum are great choices if you like a classic, white metal. Yellow & Rose Gold are also beautiful options. If you want an edgier look, you could even choose a blackened silver chain! Your special stone will always be close to your heart in your newly designed necklace and you will create a piece that you can wear everyday with love. Do you love stacking different bracelets and creating your own look mixing all different styles? If so, creating a custom bracelet with your heirloom stone is definitely something to consider. Stacking rings, necklaces and bracelets has been trending for a few years now and we don't see this trend going anywhere. Imagine how much more meaning your signature stack would have if it included a bracelet with your family stone. It will be truly a one-of-a-kind piece that no one else will have. Trends don't last forever, but your unique bracelet will stand the test of time and will be something you can definitely wear by itself. This option isn't for everyone but some may choose to trade or sell their heirloom stone. If you don't think you will ever wear or be able to use your family stone, you should consider trading it in or selling it. It is easy to trade in your stone for cash or a store credit. Then you have the option of picking out something you absolutely love and will wear everyday. There is absolutely nothing wrong with this option as long as you are okay with parting with your original heirloom stone. In the end you will still have a meaningful piece of jewelry to pass down to future family members.